The Military Collegium of the Supreme Court of the Soviet Union (Russian: Военная коллегия Верховного суда СССР) was created in 1924 by the Supreme Court of the Soviet Union as a court for the higher military and political personnel of the Red Army and Fleet. In addition it was an immediate supervisor of military tribunals and the supreme authority of military appeals. During 1926–1948 the Chairman of the Collegium was Vasili Ulrikh. The role of the Military Collegium drastically changed after June 1934, when it was assigned the duty to consider cases that fell under Article 58, counter-revolutionary activity. 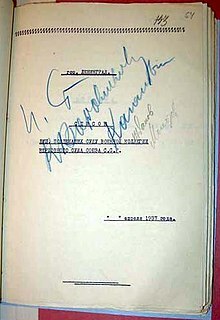 During the Great Purge of 1937–1938 the Military Collegium tried relatively prominent figures, usually based on the lists approved personally by Joseph Stalin, the majority of Article 58 cases having been processed extrajudicially by NKVD Troikas. In particular, the Military Collegium conducted the major Soviet show trials. The Collegium was also involved in subsequent trials of Polish General Leopold Okulicki, the last commander of the Polish Home Army, and Jan Jankowski, Polish government delegate. This page was last edited on 8 March 2018, at 20:21 (UTC).